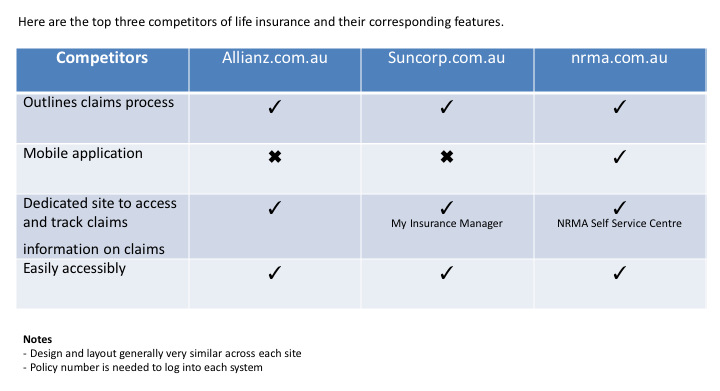 The Claims Tracker was the first project I worked on at MetLife Insurance Australia. Claims Tracker is a simple website that holds status updates for users who have made an insurance claim. It bridges the gap between submitting a claim and either being declined or granted your claim pay out by keeping the customer informed 100% of the time. My role during the project was everything UX, turning complex processes/ideas into simplified answers and seeing the project through to hand over to a front end developer. I had to get grips with the company structure, what systems control different services, fully understand the claims experience and how we as a company interact with our customers. Currently, users have no idea what stage their claim is at once a claim is made, apart from small updates there isn’t much in the way of communication from the insurer. Sometimes claimants can wait up to 12 months without hearing anything from the insurer. To provide trust and transparency to the customer, the Claims Tracker bridges the gap by keeping constant updates and tasks related to their claim. One of the biggest issues we found (through talking to customers) is trusting life insurers. A way to combat the business wnated to start being more open and transparent. 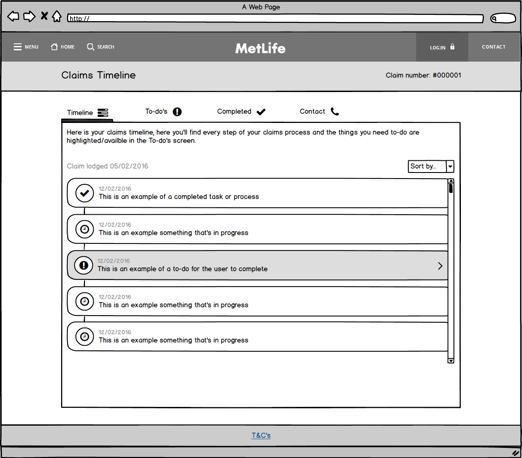 A few ideas MetLife had were shrinking PDS documents (a 50 page document sent to customers when they take out insurance), using simple language throughout all digital/printed collateral and providing users with constant updates when they’ve made a claim (using the new Claims Tracker). 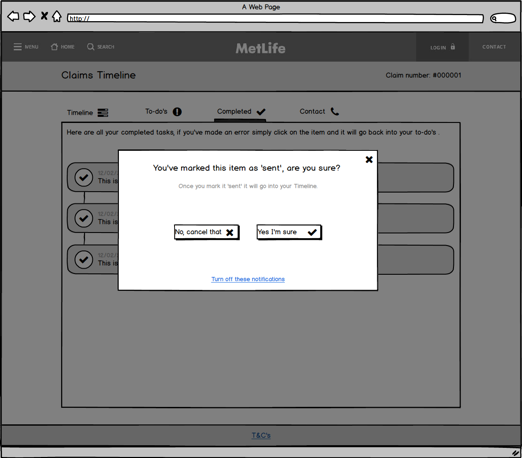 One of the hardest challenges as a UX designer was working out how the Claims Tracker would fit into Metlife's legacy systems. Working with old technologies really limits the capabilities of how we present information to the customer. Due to the digital team being new at MetLife, part of my role was to educate other teams within the business about UX and how it can benefit the business. Lastly, another big challenge was getting the buy in from international teams for funding. Many documents, presentations and prototypes were sent to the global team in the USA and eventually after many months approval was given. Research was lead by our customer insights guru Adam Innocenzi. With an already great resource of information to tap into (from previous projects), Adam ran focus groups and sent out surveys (via Survey Monkey) to engage with customers to gauge perception of the Claims Tracker. An initial competitor review showed that almost all of competitors had no form of tracking a claim and didn’t have a standalone system for this task. However, we did look to companies that sold car insurance, they had different forms of claims tracking and we could learn the approach they took when designing and building. From creating the user journey we found that there were different ideas and features we hadn’t considered. Creating the user journey really helped to get inside the users mind and empathise with them. Sketching was essential to visualise the UI, I found sketching to be a great talking point for the other stakeholders, they could quickly see my thought process and give instant feedback. I largely took to Dribbble for the latest design trends and to gather inspiration on simple UI elements. Wireframes were created quickly using Balsamiq, exported and moved into InVision for prototyping. Both desktop and mobile wireframes were created to show how the site would respond to a smaller screen size, and more importantly how the user would navigate. Adam lead the testing aspect of the project. Adam and I collaborated on the types of questions we would ask customers. Adam spoke with 15 customers separately, firstly speaking about their experience with MetLife and then presented the Claims Tracker. Some really interesting insights came from the user testing sessions, issues with written copy and explanations had to be added and corrected. All assumptions I had around possible issues were quickly cleared up during user testing sessions. The outcome gave users a way to easily see the state of their claim and more importantly complete any tasks related to the claim. The Claims Tracker tested well with customers and had very little in the way of changes. Due to the slow nature of the insurance industry the Claims Tracker hadn’t been released during my time there. The Claims Tracker has now been launched and is only accessible through the insurance admin tool.